Kiddy World Publishing, 9789491882173, 160pp. 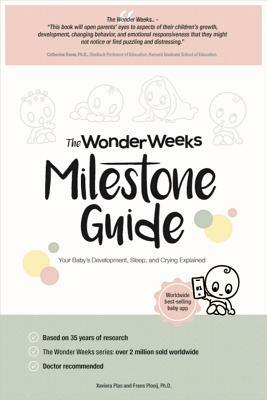 While The Wonder Weeks is all about babies first 20 month, The Wonder Weeks Milestone Guide informs parents on other topics than the mental health explained in The Wonder Weeks. Together they are the most complete resources for parents to turn to. One single book with all the answers why babies do what they do. Unique developmental charts; learn when the average age is when a baby is able to do something and what the minimum and maximum age is. Fill-in schedules; get insight into your baby's sleeping and crying behavior by filling in. Get an overview of your baby's teething schedule. Unique insights into babies' development. Practical and concise information From the authors of the number one bestselling book on infant mental development The Wonder Weeks. Frans Plooij, Ph.D., and Xaviera Plas-Plooij are a father-daughter team. Dr. Frans has researched parent-baby interaction for more than 35 years. Xaviera is a Wonder Weeks expert and mother of three. Their child development books, available in 16 languages, have sold more than two million copies worldwide.